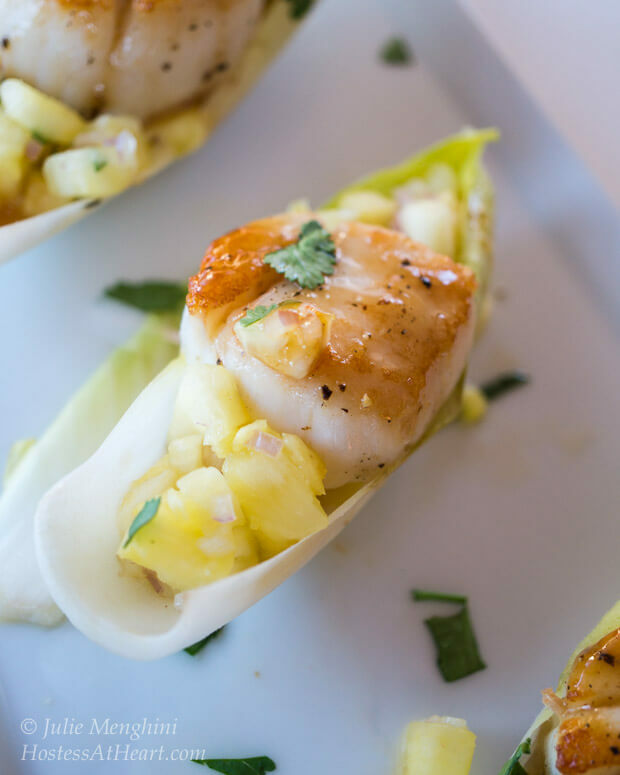 Scallops with Pineapple Salsa and Plum Wasabi Drizzle make an impressive appetizer. No one needs to know how quick and easy it is to make. Do you love seafood? I do with a couple exceptions. I don’t care for oysters, and have never been a huge scallop lover. So, when I was brainstorming for new recipes, I was completely shocked when this recipe for Scallops with Pineapple Salsa and Plum Wasabi Drizzle started formulating in my little pea sized brain. I love having friends over and always plan on an appetizer or two to kick off the evening. Sometimes they are simple and sometimes I like getting a little fancier. This recipe would come under the fake-out fancy category. They are so fast and simple to make, but I think they look fancy. Another thing I like about the ingredients in this recipe is that they are available year round, even in the frozen tundra of Nebraska. I served this recipe in endive lettuce leaves by shaving just a bit off of the bottom of the leaf so that they would stand up. 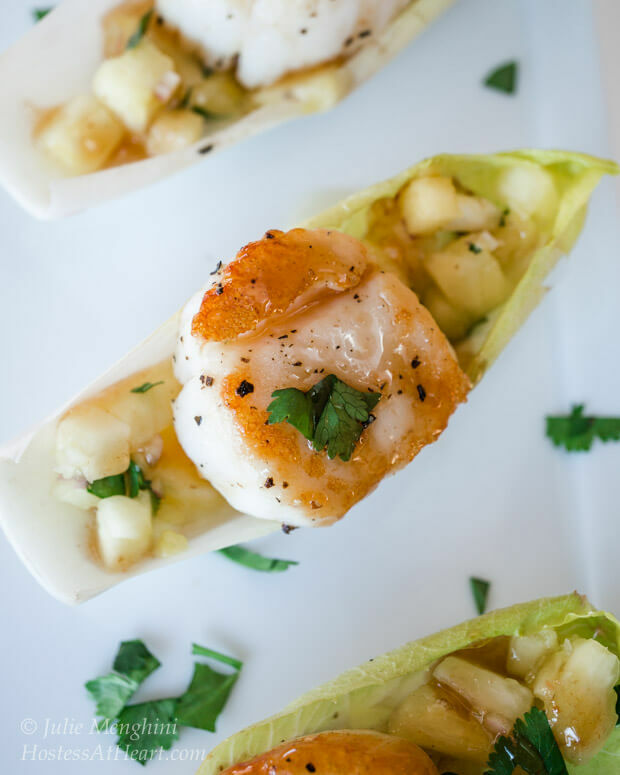 The endive also makes a great vessel to hold the yummy salsa and delicious plum wasabi sauce. I drizzled this sauce on. John poured this sauce on. Man is it good. It starts off sweet and then you get the “OH MAN” from the wasabi. I’m a wimp with the hot stuff so went middle of the road. You can adjust it to your tolerance. I also wanted the flavors balanced and not all about the wasabi. 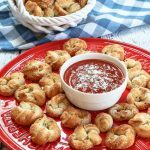 This appetizer is delicious hot or cold, so they can be made in advance and assembled before guests arrive or when you want a nice light lunch. They are delicious with a glass of white wine too! Scallops with Pineapple Salsa and Plum Wasabi Drizzle make an impressive appetizer. No one needs to know how quick and simple it is to make. Combine the salsa ingredients together and the plum wasabi sauce ingredients together. Set aside. Wash and dry scallops. Salt and pepper both sides. In a skillet, heat oil over a medium-high heat, until an added drop of water sizzles. Add scallops, and cook on the first side for 2 minutes. Don't attempt to move them until it is time to turn them. Cook on the other side for an additional 3 minutes. Remove from the skillet. Fill each leaf with pineapple salsa. Top with a scallop and drizzle with plum wasabi sauce. 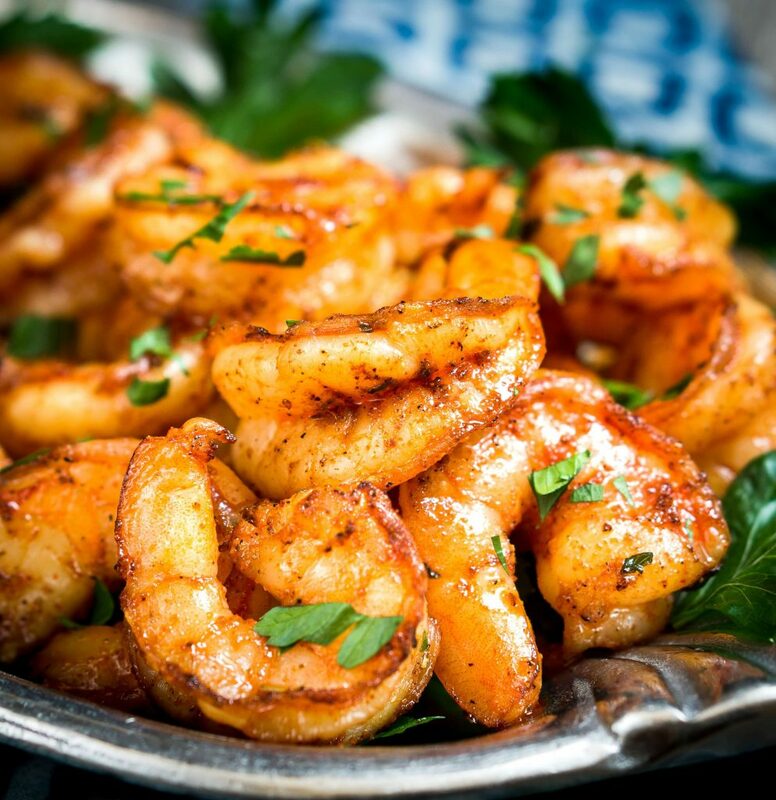 IHere are a few more seafood appetizers that we love! 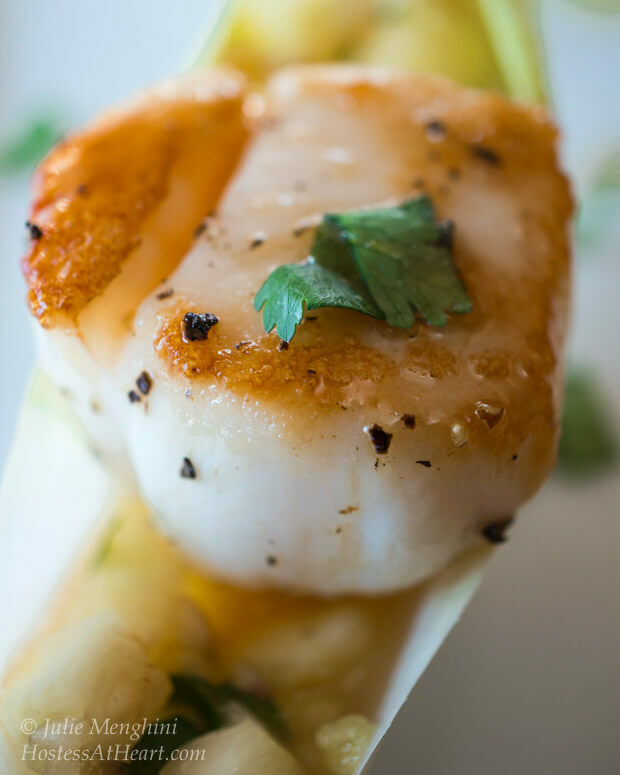 Scallops are such a hit or miss, and you’ve definitely hit the ball out of the park with this one! They almost remind me of ants on the log visually. I bet wasabi adds a little bit of needed spiciness. Great job! Thank you so much Aida! I totally agree with you on the hit or miss. I can’t say I was ever a fan, but I sure enjoyed these and will make them again. I appreciate you stopping by and leaving such kind comments. I love love seafood! 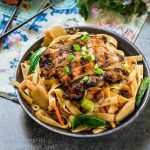 This recipe has me bowled over! I could have the whole platter! Congratulations on being featured! Happy FF! Thank you! I was truly honored to be featured. It’s always so hard to pick featured recipes when hosting because we have so many amazing people in the FF group. Love me some seafood, Julie! These scallops look amazing! Thanks Debbie. They were delicious! I’d never cooked them before and was really happy with the results. Wow these are simple amazing looking and sounding! I really wish I could just pick one up! Stunning photos too, well done! Thank you so much! Once in a while something just works and this was one of those dishes for us. Enjoy the rest of your weekend! 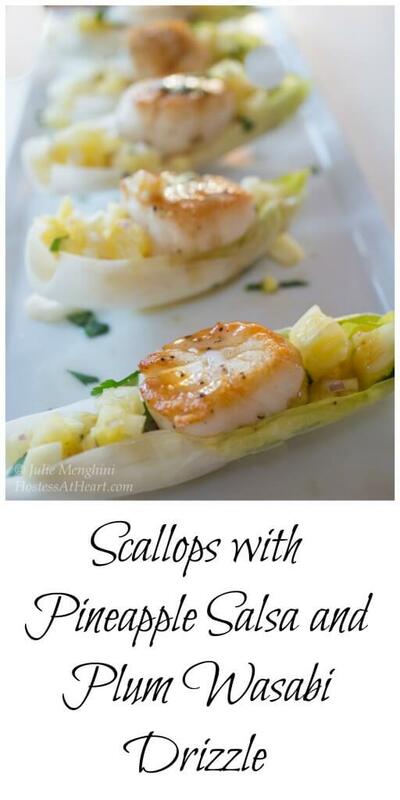 Yum scallops are one of my favorite seafoods – how delicious this sounds! 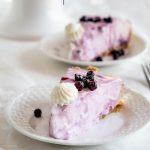 Thanks for sharing this recipe, pinning for later, found you at Tornadough Alli! Thank you Katie! I’m very happy that you popped over. I need to run over there and check out all of the amazing entries this week. So yummy, Julie! And I love the little endive boats you used to serve them! I can’t quite imagine all those flavors, but they do look good. This looks incredible, Julie! I had to pop in and see what this was about–you had me at “scallop”! and “wasabi”! 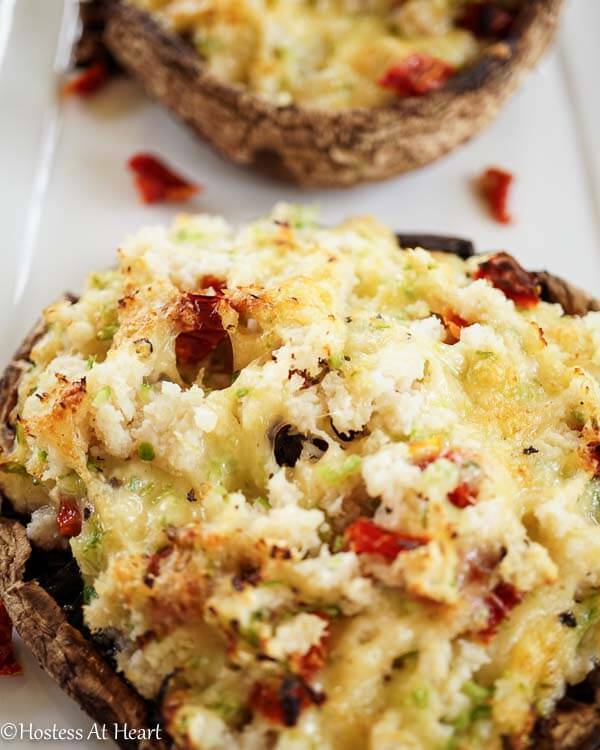 Seriously, restaurant-worthy recipe–love it! Thank you Tracey! I was really happy with this one. Wish all of my experiments ended well….not. Have a great evening, and thanks again for stopping over! Wow Julie, very exotic looking appetizer we have here! 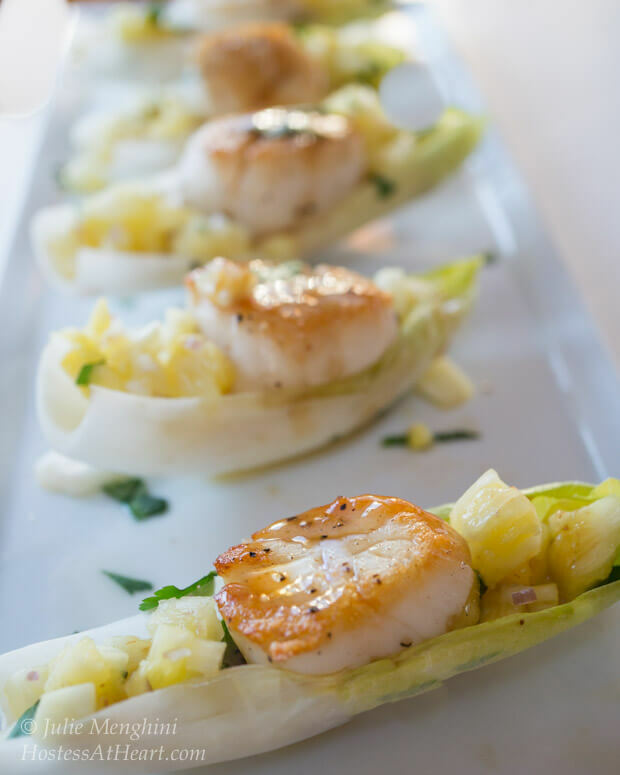 I adore scallops, and love your presentation of them in the wee endive boats. So delicate and showy. Now, I love wasabi, and I can only imagine what it tasted like with the plum sauce and soy mixed in. Lovely! I could easily down that entire plate up with a glass of pinot grigio. :). Very nice indeed! Thank you Loretta! John actually ate most of this plate for lunch! I managed to snag a couple to make sure they were blog worthy. 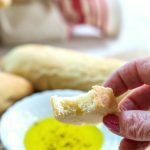 I’ll be making these again and they would definitely be better with a glass of pinot grigio! I have never liked seafood but these would tempt me! So beautiful! I’m kind of picky to Lynz. I have to have the right texture and smell otherwise I’m not going there. Thank you! My mouth is watering just looking at your photos! I love scallops and these appetizers are so pretty! Thank you Jenny! This will be a rerun in my house! Oh my goodness! I almost reached out to the screen to grab one! Not sure how I missed this. I adore the flavour combination, I have to say adore because it sounds so impossibly delicious I wish I had one right now! Petra I will take your saying that one of the highest compliments. You are so talented when it comes to seafood. I hope you’ll let me know what you think if you try them. Thank you for stopping, and I hope you have a wonderful evening! Thank you Mary! It would be a great start indeed. Enjoy your evening, and I appreciate your kind comments! OMG! Plum wasabi drizzle?! These look awesome! Thank you Susan! This stuff really turned out delicious. Thanks you for stopping and commenting! Your scallops look amazing! I love seafood – everything, and I love endives. I will definitely try this recipe. Thank you Ana! I hope you will, and please let me know what you think. Enjoy your lovely day! OMG Freda! The same thing happened to me with those dried red Chinese peppers. I ate one and thought I was going to have a hole in my throat! It was horrible. 1/4 teaspoon isn’t going to get you in trouble here, I promise. I’m a wimp and fashioned this for people like me. John likes hot and he can always take more out of the fridge. Yes Julie! This amount of wasabi is perfect 🙂 I normally like spicy food, but wasabi has a totally different kind of heat. It is a strong flavor guaranteed to clear your sinuses! The absolute Seafood Lover in me; it is a definite winner!!! OMG Jule, I totally love this appetizer. It’s just perfect. Beautiful, elegant, delicious. Saved to make this soon. Thank you Suzanne! We really enjoyed it, and I loved how quick and easy it was. I would love this appetizer Julie but I would have to use shrimp or lobster – never cared for scallops! Endive is a great vessel for serving your recipe. Might have to make for Super Bowl! Thank you Judi! I never liked scallops either Judi so was shocked how much I liked these. Crab or lobster would be amazing though. The sauce would be great on either. Wow! This looks so amazing! I want a bite!! Wonderful! Thank you Lina! It was fresh and delicious.